Prince George's County, Md. 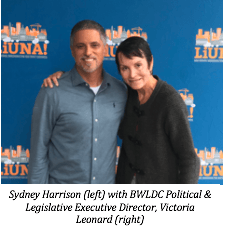 (October 11, 2018) -- Today, the Baltimore Washington Laborers’ District Council (BWLDC), an affiliate of the Laborers' International Union of North America (LIUNA), announced its endorsement of Democratic nominee Sydney Harrison for District 9 Councilmember in Prince George's County, Maryland. Mr. Harrison began his career as a plumber, providing him with first-hand experience of the demands of construction work. Later, Mr. Harrison became a small business owner, and in November 2014 was elected to serve as the Clerk of the Court for Prince George's County. He also represents District 27 on the Prince George's County Democratic Central Committee and a member of the Brandywine North Key's Civic Association. Across the Baltimore-Washington region, the BWLDC seeks to endorse and support candidates for elected office who align with the values of its members. The endorsement of Democratic nominee Sydney Harrison for District 9 Councilmember is part of that effort.